Have You Forgotten To Have Fun Recently? To most people, I am more of a serious person than a fun person. I spend more time cleaning the house, doing work, running errands than having fun. To most people, these are hardly fun activities. These days, I hardly have weekends away from the computer doing work. I think I have genuinely forgotten how to have fun? And that is pretty contradictory to my advice in my blog post below on stressing less? I am having more fun than ever in my life doing the most mundane (to most people anyway) things. When I clean the house, I see it as exercise for the day and working off the unwanted calories. I see itas beneficial for my health and well being. When I do work, I do it with passion and excitement. I work long hours but I love the thrill of satisfaction. I am in Beijing now with husband for work. It is starting to get warmer in Beijing and I notice that people are more outgoing more smiley and more colourful in their dressing. There is definitely more positive glow on everyone's faces as we move into better weather period. Everyone just seems to have a more positive attitude generally. It must be the better weather and the anticipation of more outdoor activities like picnics and hikes, which have brought on general positivity and beautiful colours. Anticipation of better days gives positive glow. Which got me thinking. How does a person always bear anticipation of better days no matter how sucky life can be at times? 1. Start each day with a positive smile. No matter what happens. If you start each day with a positive attitude, you will anticipate a better day ahead. You will thus work on creating a better day for yourself. If you've been on dialysis for as long as I have, pretty soon, you'll start to get sick of the routine and start to get some sort of a death wish. I'm not saying all dialysis patients have a death wish but I certainly did. I started drinking water, tea, coffee, juice, soups whenever I wanted too, without care of how much fluid I was ingesting. After years of tight fluid control, suddenly, I began thinking in a "Damned if I do and damned if I don't" kind of way. In other words, I started getting sick of watching normal people chug down ice-cold drinks and the like and started feeling this way : "Why can't I do it too?!". Of course, as a dialysis patient, the cardinal rule is : watch your fluid intake, keep it down to less than 500ml if you can! But after doing this for so long, I guess I began to rebel. I started thinking : "Must I go through life thirsty and longing to drink more?". Super Excited With My New Business Venture! I'm always cross-stitching something or other. And I have a few finished unframed pieces in my collection. Today, I decided to photograph them and post them online for sale! This is my new business venture! I hope you will like my work and order something! I will be posting new pieces as I complete them! Hunting for local food has always been an important activity during my travels. I simply refuse to dwell on food calories when I'm away. My eating and sleeping schedules would go haywire. But luckily, the recent trip to Bali was with just friends. So my kids were not there to witness the mommy-breaks-the-rules-so-why-can't-we activities. 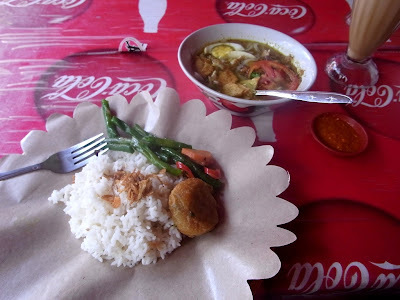 The scenic Bali island offers Balinese specialties that are simple yet delectable. One thing I savoured most was their soto ayam (Indonesian chicken soup). That one medium-sized bowl of broth was so complete and satisfying that other foods served there seemed unappealing. Though I was pretty startled at first when I noticed just how much things were thrown into the soup (fried sliced potatoes, tomatoes, shredded chicken, vegetables, eggs, tofu etc), I then realized that they had actually perfected the soup.